Red chili pepper is hot. That's what we all knew. But there are people who can eat it just like candy, saying that it is tasty, sweet, and medicinal. Several months or about a year ago, I had mentioned that spinach is good for anemia. Then, replies came to me saying that they have been eating spinach for nearly a year, but their anemic symptoms had never improved. Here, you should know that it is not only spinach that makes you healthy. Yes, a hot chili pepper can reduce your cholesterol dramatically in one day. Again, don't take this out of context. Remember that a high amount of cholesterol in your blood may be due to incorrect nutrients in your diet, too. Can I Eat a Lot of This "Hot" Chili Pepper Every Now and Then? Yes, you can definitely eat that hot red chili pepper just like candies, while building a healthy body. The first thing you want to do is to remove the hot taste in chili. You may wonder, is that even possible? Before we go on further, let's take a brief look on where that hot taste of chili comes from. You will notice that many housewives remove the seeds in chili pepper believing that it is the source of hot taste. Is it really the seed that is hot? As you can see from the illustration above, a fresh chili pepper consists of the skin, seed, and the cotton-like placenta. The hottest part of the chili is actually the cotton-like placenta that is surrounded by seeds. People believing that the seeds are the hottest is a common misconception. After removing the placenta, you will be able to chew and eat the chili pepper without feeling any burning sensation or hotness. You will also be surprised on how spicy and sweet it is just like fruits. 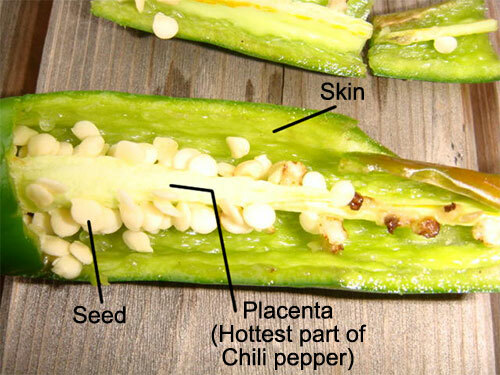 However, once the pepper dries and gets hard, the placenta tends to break, evaporate, and stick to its seeds and skin. Then, you won't be able to chew and eat it unlike when it is still fresh. Thus, dried chili pepper remains hot, and there's nothing you can do about it. History tells that in China, a special spice called Rayu or Layu became very popular all over the world. Most of popular Chinese, Korean, Japanese, Mexican, Oriental, and other Far Eastern restaurants use this special spice. Rayu is a chili-infused vegetable oil, typically sesame oil or even liquor. It can add taste and flavor, and of course with nutritional values to the dishes. This rayu seems to have been brought to various countries especially to Latin America by Christopher Columbus. Every restaurant creates their own tastes as their trade and trade secrets. Today, science has found that it is not only nutritious but also medicinal in nature. 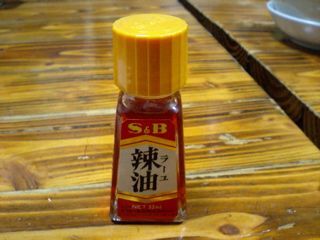 Homemade and commercialized liquid chili pepper seasoning contained in a small bottle, can be commonly found it Chinese restaurants. According to the dictionary, the pungent ingredient of chili pepper, within the placenta is called "capsaicin", which is insoluble in water. This means you cannot remove that hot taste even when you cook chili pepper with water. However, the dictionary continues to say that capsaicin is highly soluble in alcohol. Chili peppers are good for preventing lifestyle-related diseases. Rayu can reduce your cholesterol overnight. You'll be surprised that we have a lot of such reports from various people around the world. The quantity you need to consume is about two teaspoons of rayu in a day. Rich in vitamin A and C, chili pepper is highly effective in preventing summer fatigue. It has bactericidal activity that helps prevent food poisoning. It is often used particularly in hot areas of tropical countries. 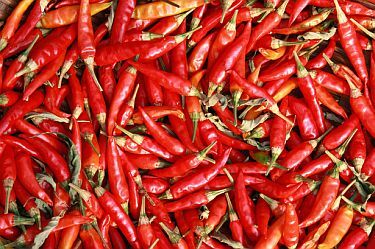 Capsaicin, the pungent component of chili peppers helps relieve stomachache, heavy stomach, and nausea. It is also highly effective in preventing gastritis, by promoting the secretion of gastric mucus. Chili pepper helps boost your metabolism. It encourages increased energy metabolism, by having a confining effect to the body temperature and increasing heat. 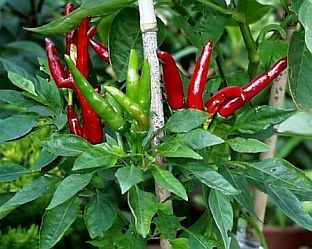 Chili pepper can be used as a natural insect repellent for your garden. You can use it for the purpose of reducing insect damage to plants. 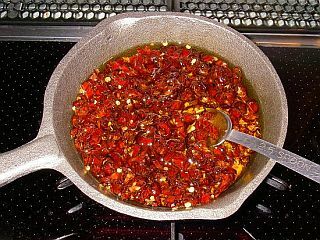 You can find how hot pepper chili oil is made in the internet. Just search for "how to make hot pepper chili oil". Enjoy your eating habit and get healthier than ever before. Hot pepper chili oil has a power to eradicate the negative energy (dark matter/energy), just like the PYRO-ENERGEN machine.